TIM (T cell, Ig, mucin) proteins can regulate T cell immune responses. Tim-4 mRNA is not expressed in T cells, but exclusively in APCs. Tim-4 is a ligand for Tim-1 and Tim-4.Ig fusion protein was shown to either inhibit or expand T cells. However, the molecular basis for such opposite effects was not defined. By generating mAbs, we show that expression of Tim-4 protein is restricted to CD11c+ and CD11b+ cells and is up-regulated upon activation. We show that Tim-4 specifically phosphorylates Tim-1 and induces T cell expansion by enhancing cell division and reducing apoptosis. Tim-4 also induces the phosphorylation of signaling molecules LAT, Akt, and ERK1/2 in T cells. Tim-4, expressed on APCs, is a costimulatory molecule that promotes T cell expansion and survival by cross-linking Tim-1 on T cells. The recent identification of the Tim (T cell, Ig, mucin)5 gene family introduced a new family of cell surface proteins that are potentially involved in the regulation of effector T cell responses. Since the initial discovery of the Th1-specific cell surface protein Tim-3, the Tim gene family has expanded to include eight members in mice (Tims 1–8) and three in humans (TIM-1, TIM-3, and TIM-4) (1, 2, 3). Accumulating data suggest that several of the Tim molecules play critical roles in the regulation of Th1 and Th2 immune responses. Tim-3 is specifically expressed on the surface of effector Th1 cells, and its interaction with its ligand serves to terminate Th1 responses and maintain peripheral tolerance (4, 5, 6). Tim-2 is involved in the regulation of Th2 responses (7, 8, 9), and Tim-1 has recently been shown to costimulate effector T cell expansion, with a preferential role in costimulating Th2 cells (10). Human TIM-1 and TIM-3 have also been implicated in Th cell responses (11, 12, 13, 14), indicating that the TIM molecules may represent an evolutionarily conserved system of cell surface molecules important for the regulation of effector T cell function. We recently characterized Tim-4 which, unlike the other Tim genes, is not expressed in T cells, but at the mRNA level was shown to be expressed in APCs, particularly mature lymphoid dendritic cells (15). This unique expression pattern of Tim-4 led to the hypothesis that another Tim family member expressed on T cells might serve as its receptor. Indeed, we found that Tim-1 is a receptor for Tim-4, and the Tim-1—Tim-4 interaction is involved in the regulation of Th cell responses and the modulation of the Th1/Th2 cytokine balance (15). When given in vivo, Tim-4.Ig enhances proliferation and cytokine production from responding T cells. 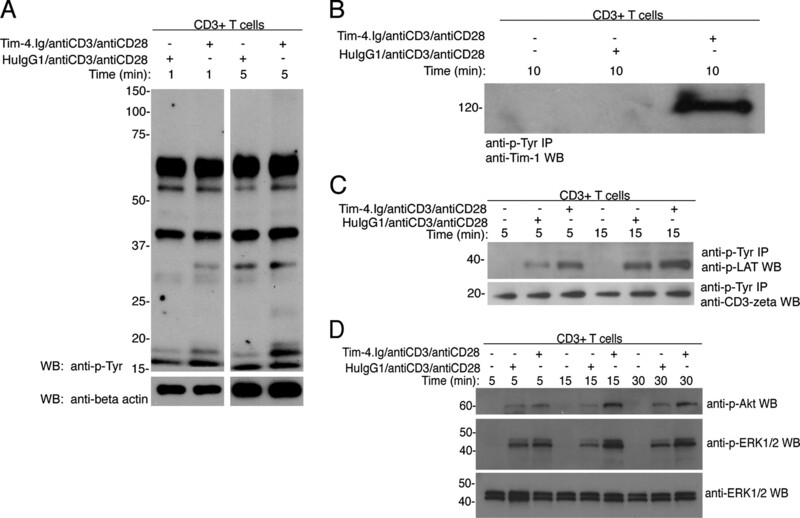 We observed, however, that cross-linking with plate-bound Tim-4.Ig resulted in enhancement or inhibition of proliferation of responding T cells depending upon the dose of anti-CD3/anti-CD28 used in in vitro proliferation assays. These data raised the issue of the biological function of Tim-4 and whether Tim-4 is an inhibitory or an activating molecule on APCs. Interestingly, cross-linking of the Tim-4 receptor, Tim-1, using an anti-Tim-1 mAb along with TCR ligation, led to an increase in T cell proliferation (10). In another study, ectopic expression of Tim-1 resulted in phosphorylation of the Tim-1 intracellular tail and the induction of NFAT (16). Furthermore, mutation of Tim-1 tyrosine-276 to phenylalanine decreased NFAT/AP-1 transcriptional reporter activity following TCR stimulation (16). These data suggest that Tim-1 tyrosine phosphorylation is relevant to its function and that Tim-1 is a positive costimulatory molecule. Because Tim-1 is a receptor for Tim-4, it was difficult to reconcile the observation that Tim-1 plays a role in NFAT activation, with the inhibition of T cell proliferation observed with plate-bound Tim-4.Ig treatment. In the present study, we generated anti-Tim-4 mAbs to analyze the expression of Tim-4 protein and confirm that Tim-4 protein is expressed on mature, activated dendritic cells and macrophages, but not on T cells. In addition, we show data that support a role for Tim-4 in inducing T cell expansion by cross-linking Tim-1 and have begun to identify the signaling pathways triggered by Tim-4. Our results indicate that Tim-4 is expressed on mature APCs, and suggest that Tim-4 may promote T cell responses by both inducing cell division and by promoting T cell survival. All mice were purchased from The Jackson Laboratory. To activate APCs in vivo, C57BL/6, BALB/c, and SJL/J mice were injected with 40 μg LPS (Sigma-Aldrich) or PBS i.p. and sacrificed 24 h later. Spleens were treated with Collagenase D (Roche) for 45–60 min and splenocytes were then analyzed by flow cytometry. Abs used in flow cytometry from BD Pharmingen were allophycocyanin- or FITC-labeled anti-mouse: CD11b, CD11c, CD4, and CD8; FITC- or PE-labeled anti-mouse: B7.1, B7.2, MHC class II (OX-6), and CD8; streptavidin-PE, and specific isotype controls. Anti-Tim-4 mAb-binding was detected by using FITC-labeled goat anti-rat IgG1 (BD Pharmingen) or anti-Tim-4-PE mAb conjugate (Phycolink R-PE Conjugation Kit; Prozyme). Anti-phosphotyrosine (anti-p-Tyr)-agarose beads (Santa Cruz Biotechnology) were used to immunoprecipitate phosphorylated proteins and anti-pTyr (4G10) and anti-β-tubulin were from Upstate Biotechnology. Anti-p-LAT (Y191), anti-p-Akt (S473; 193H12), anti-p-p42/44 kinase (Thr202/Tyr204; ERK1/2) and anti-p42/44 kinase were from Cell Signaling Technology, and anti-CD3-ζ (6B10.2), anti-Bcl-2 (C-2), anti-Bcl-xL/S (S-18), anti-HA-HRP (F-7), anti-mouse IgG-HRP, and anti-rabbit IgG-HRP were from Santa Cruz Biotechnology. Anti-β-actin was from Abcam. Biotinylated anti-Tim-1 Ab was from R&D Systems and was detected using streptavidin-HRP from Pierce. Anti-Tim-4 mAbs were generated by immunizing a female Lewis rat (Harlan Sprague Dawley) with 200 μg Tim-4.Ig fusion protein (15) in CFA (Difco). The rat was boosted five times with Tim-4.Ig, and on day 21, lymph node cells were obtained and fused with SP2/0 myeloma cells using 50% PEG 1500 (Roche) as described previously (17). Hybridoma supernatants were screened by ELISA on Tim-4.Ig and huCTLA-4.Ig (Chimerigen). Supernatants from the positive clones were further screened by flow cytometry on Tim-4 transfectants vs control (Tim-1 or Tim-3) transfectants. Positive wells were subcloned, and selected hybridomas were expanded. CHO-Tim-4 or control transfectants were lysed in WCE buffer (50 mM Tris (pH 7.5), 150 mM NaCl, 0.5% Nonidet P-40, 0.2 mM EDTA, 2 mM EGTA, 10% glycerol, protease inhibitors; Roche). Lysate supernatants were incubated with protein G (Roche) and protein L beads (Santa Cruz Biotechnology) to preclear and then either anti-Tim-4 mAb 5G3 or rIgG1 isotype control (BD Pharmingen) was added. Lysates were incubated with protein G: protein L beads for 24 h, after which samples were deglycosylated using Prozyme GlycoPRO reagents. Tim-4.Ig/antiCD3/antiCD28- or HuIgG1/antiCD3/antiCD28-coated beads (described below) were used to stimulate 1–2 × 107 CD3+ C57BL/6 T cells at a ratio of 4–6 beads: 1 T cell for the times indicated in the text. T cells were then washed in PBS/1 mM PMSF (Sigma-Aldrich) and incubated with lysis buffer containing Na2VO4. Protein concentrations were measured using the Dc Protein Assay Kit II (Bio-Rad). Samples were run on 10% or 4–20% SDS-PAGE gels and proteins were transferred to either nitrocellulose or PVDF membranes (Bio-Rad). Membranes were blocked in TBST/5% milk (or TBST/3%BSA for anti-p-Tyr blots), developed using the appropriate HRP conjugates, and then washed and developed by ECL (Amersham Biosciences) or Western Lightening (PerkinElmer). Blots were analyzed using National Institutes of Health Image software (http://rsb.info.nih.gov/nih-image/). For in vitro DC generation, bone marrow cells were flushed from SJL/J femurs, erythrocytes were lysed, and remaining cells were plated at 106/ml with 200 ng/ml Flt3L (BioSource International). After 8 d, 40 ng/ml LPS was added to some cultures for 12–14 h. Cells were harvested after a total of 9 d. Flt3L-induced cells were depleted of granulocytes, erythrocytes, and plasmacytoid cells by MACS negative selection with Gr-1, TER-119, and B220 Abs (eBioscience) (resulting in a mainly CD11c+ population). Mock-transfected or Tim-4-transfected CHO cells were tested for their ability to activate T cells. CHO cell transfectants, which have previously been described (15), were incubated with 50 μg/ml Mitomycin C (Sigma-Aldrich) for 3 h at 37°C and were then harvested, washed 2–3 times with PBS, and placed on ice for 1 h. Cells were again washed two to three times and then incubated at 2 × 104/well for 3–5 h at 37°C. All CD3+ T cells used for experiments were purified from SJL/J or C57BL/6 lymph nodes by negative selection columns (R&D Systems) and then plated on a tissue culture dish for 1 h at 37°C to remove any contaminating APCs. The nonadherent cells were removed as the T cell fraction. A total of 105 T cells were then added to the previously plated mock- or Tim-4-transfected CHO cells, with 2.5 μg/ml anti-CD3 (145–2C11) and anti-CD28 (37.51) (BD Pharmingen). Anti-Tim-4 mAbs or isotype control were added as the blocking reagents to test the extent of Tim-4 contribution in T cell costimulation. Plates were pulsed at 48 h with 1 μCi [3H]-thymidine/well and measured after 16–18 h using a betaplate scintillation counter (PerkinElmer). The data are presented as mean cpm in triplicate wells. Dynabeads (Dynabeads M-450 Tosylactivated; Invitrogen Life Technologies) were conjugated with 5 μg Tim-4.Ig or HuIgG1 isotype control, 1 μg anti-CD3, and 1 μg anti-CD28 per 107 beads following the manufacturer’s instructions. Beads were qualified by flow cytometry, and Tim-4.Ig/antiCD3/antiCD28 beads were found to have comparable levels of Ab and fusion protein to levels observed on control HuIgG1/antiCD3/antiCD28 beads (data not shown). Tim-4.Ig/antiCD3/antiCD28- or HuIgG1/antiCD3/antiCD28-coated beads were used to stimulate C57BL/6 CD3+ T cells by plating 105 T cells with 4 × 105 magnetic beads/well in a round-bottom 96-well plate. Proliferation was measured after 48 h by [3H]-thymidine incorporation in triplicate wells. Supernatants from cultures were collected at 48 h, and cytokine production was measured by cytometric bead array (BD Biosciences). Cell division was monitored by CFSE dye dilution. For labeling, cells were washed with warm PBS and then incubated in warm PBS at 37°C for 5–10 min at 5–10 × 106 cells/ml. CFSE (Invitrogen Life Technologies) was then added at 1.5 μM and cells were incubated for another 5–10 min. at 37°C. An equal volume of cold FBS was added to quench the CFSE, followed by two washes with cold PBS/10% FBS. One × 106 T cells were plated with 4 × 106 Tim-4.Ig/antiCD3/antiCD28- or HuIgG1/antiCD3/antiCD28-coated beads/well in a 24-well plate. Cells were separated from the magnetic beads by gently passing the sample against a magnet, and then analyzed by flow cytometry for CFSE dilution after 48, 72, and 96 h.
To measure apoptosis, nonlabeled T cells were separated from the activating beads at 24, 48, and 72 h and stained with anti-CD4 allophycocyanin or anti-CD8 allophycocyanin and the AnnexinV-FITC apoptosis detection kit I (BD Pharmingen). Samples were analyzed by flow cytometry for the presence of AnnexinV or PI+ cells. We have previously shown that Tim-4 is expressed at the mRNA level in mature CD8+ DCs. However, whether Tim-4 is expressed as a protein on ex vivo DCs has not been previously addressed due to the lack of a Tim-4-specific mAb. We therefore undertook the generation of anti-Tim-4 mAbs to determine the pattern of Tim-4 expression in vivo. To qualify the anti-Tim-4 mAbs generated, we transfected CHO and HEK 293 cells with cDNA encoding full-length Tim-4 with an N-terminal HA tag and were able to observe its expression on the surfaces of both cell types by anti-HA Ab staining (Fig. 1⇓A). Of the subcloned hybridomas from our fusion, three produced mAbs specific for mouse Tim-4. These three mAbs, designated 5G3, 3A1, and 3H11, bound to Tim-4 and not to any other Tim molecule, as demonstrated by both flow cytometry and ELISA analysis (Fig. 1⇓, A and B, and data not shown). All three Abs are of the rat IgG1 isotype. Anti-Tim-4 mAbs specifically bind Tim-4. A, HEK 293 and CHO cells stably transfected with Tim-4 or Tim-1 were stained with three anti-Tim-4 mAbs and analyzed by flow cytometry. Staining with an anti-HA-tag mAb was used to control for Tim-4 expression and an anti-Tim-1 mAb was used to control for Tim-1 expression. All histograms represent specific staining (black) vs isotype control (gray). B, Binding of anti-Tim-4 mAbs was tested on Tim-4.Ig or human CTLA-4.Ig-coated ELISA plates. C, Tim-4 was precipitated from CHO-Tim-4 vs CHO-Tim-3 lysates with anti-Tim-4 (5G3) or isotype control (rIgG1) and detected by Western blot. Cell lysates were deglycosylated by prior treatment with β (1 ,2 ,3 ,4 ) galactosidase and β-N-acetylglucosaminidase. We next used the 5G3 mAb to determine the size of the Tim-4 protein. Anti-Tim-4 mAb 5G3 was used to immunoprecipitate Tim-4 from lysates of CHO-Tim-4 and CHO-Tim-3 transfectants. The Tim-4 mucin domain is predicted to be heavily O-glycosylated; we therefore removed O-linked sugars from the immunoprecipitates by treating them with β (1, 2, 3, 4) galactosidase and β-N-acetylglucosaminidase. Samples were separated on an SDS-PAGE and then immunoblotted with anti-HA-HRP since the transfected Tim-4 contains an HA tag. We were able to observe a clear band at ∼70 kDa as detected with anti-HA-HRP (Fig. 1⇑C). The mouse Tim-4 cDNA is 1032 bp in length, which would be predicted to be translated into an unglycosylated protein of ∼34 kDa. Even though these experiments were performed under denaturing conditions, we observed a band representing a protein twice the predicted size of Tim-4 (Fig. 1⇑C). It is possible that the observed band corresponds to tightly associated Tim-4 homodimers not dissociated under these conditions. However, it is more likely that this observation is due to incomplete degylcosylation of Tim-4. It should be noted that of all the Tim proteins studied thus far, Tim-4 contains the most O-linked glycosylation sites. Immunoprecipitation of Tim-4 from CHO-Tim-4 transfectants, without deglycosylation, resulted in unique bands of ∼100–85, 70, and 55 kDa that were not observed in the control immunoprecipitates (data not shown), suggesting that the larger bands could be more heavily glycosylated product and that the lower bands could be partially glycosylated forms of Tim-4. Previous studies demonstrated the highest levels of Tim-4 mRNA in CD11c+ cells followed by CD11b+ cells (15), so we next determined whether Tim-4 protein was also expressed on DCs and macrophages. We compared Tim-4 protein expression in mice that preferentially develop Th1 or Th2 responses (C57BL/6 and BALB/c, respectively) and in SJL mice that are highly susceptible to autoimmunity. Flow cytometric analysis of total splenocytes from naive mice stained with anti-Tim-4 Ab showed the highest Tim-4 expression on a subset of CD11c+CD11b+ cells in all three strains (Fig. 2⇓A), but not on T cells (CD4+ or CD8+) or B cells (CD19+). To determine the potential regulation of Tim-4 protein expression, Tim-4 expression was compared on B7high or B7low subsets of CD11c+ splenocytes obtained from unimmunized mice. CD11c+ cells expressing higher levels of B7.1 and B7.2 consistently expressed higher levels of Tim-4 than did cells expressing lower levels of the B7 molecules (Fig. 2⇓B and data not shown). Tim-4 expression was also observed on splenic CD11c−CD11b+ cells (Fig. 2⇓C). Moreover, in vivo, Tim-4-expressing cells were localized in the perifollicular and T cell areas within the spleen, but were not found in follicles or in periarteriolar sheaths (data not shown). These findings were consistent with our previous observations using quantitative RT-PCR (15) that Tim-4 is expressed on APCs and not T cells. Tim-4 is preferentially expressed ex vivo on mature APCs. A, Collagenase D-treated splenocytes from the indicated mouse strains were stained with CD11c-allophycocyanin, CD11b-FITC, RPE-conjugated anti-Tim-4 clone 5G3, and relevant isotype controls. CD11c+CD11b+ cells were gated in the upper panels. CD4+, CD8+, and CD19+ SJL splenocytes were gated as indicated in the lower panels. B, Splenocytes from A were stained with CD11c-allophycocyanin, B7.1-FITC or B7.2-FITC (data not shown), and 5G3 RPE, and gated on CD11c+B7high/low cells. The differences between the mean fluorescence intensity (MFI) of the isotype control and anti-Tim-4 staining are shown as ΔMFI. C, C57BL/6, BALB/c, and SJL/J mice were injected with either 40 μg LPS or PBS (volume control) i.p. and sacrificed 24 h later. Splenocytes were treated and stained as in A; the percentage of Tim-4+ CD11c−CD11b+ cells is indicated in each histogram. To determine whether Tim-4 could be further up-regulated in vivo, mice were injected i.p. with 40 μg of LPS or an equal volume of PBS as a control, and splenocytes were analyzed after 24 h. CD11c−CD11b+ splenic macrophages showed increased expression of Tim-4 protein after 24 h of LPS treatment (Fig. 2⇑C), suggesting that Tim-4 is up-regulated upon macrophage activation. These data are consistent with previous predictions of increased Tim-4 expression on activated macrophages that were suggested by Tim-1.Ig binding (15). Our previous data using Taqman quantitative RT-PCR demonstrated that mature lymphoid DCs expressed the highest levels of Tim-4 mRNA (15). To determine whether these cells also expressed high levels of Tim-4 protein, we generated DCs in vitro from SJL/J bone marrow using Flt3L with or without the addition of LPS during the last day of culture, and depleted these cells of the plasmacytoid fraction. Fig. 3⇓A shows that LPS-treated cells up-regulated B7.1, B7.2, MHC class II, and CD8 compared with the untreated cells, indicating that LPS matured and activated the DCs. 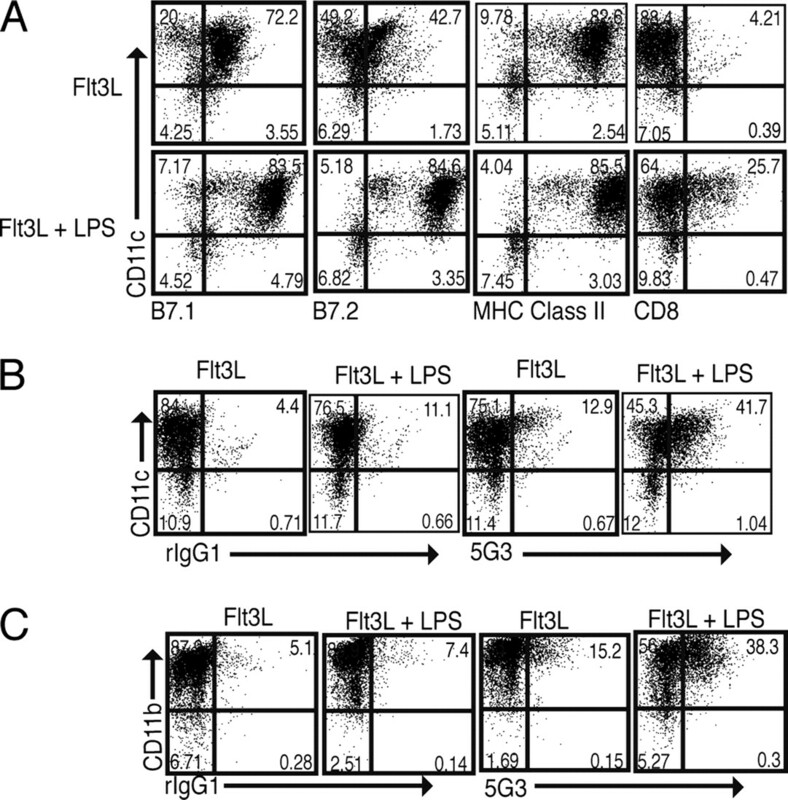 When these cells were analyzed for Tim-4 expression, 3–4-fold more of the LPS-stimulated CD11c+ cells stained with anti-Tim-4 (5G3 and 3A1) Abs than did the unstimulated DCs (Fig. 3⇓B and data not shown). Most of the Flt3L-generated DCs expressed CD11b in addition to CD11c, and Tim-4 was also up-regulated 2–3-fold on CD11b+ cells in the Flt3L plus LPS compared with Flt3L-only treated cultures (Fig. 3⇓C). These data demonstrate that, similar to mRNA expression, Tim-4 protein is expressed on macrophages and DCs upon maturation and activation. Tim-4 expression is up-regulated on activated CD11c+ and CD11b+ BM-derived cells. A, SJL/J mice were used to generate DCs in the presence of Flt3L and LPS was added to an aliquot of purified cells. At 12–14 h later, the cells were stained with CD11c-allophycocyanin, B7.1-PE, B7.2-PE, MHC class II-PE, and CD8-PE and analyzed by flow cytometry. Tim-4 expression on these cells was determined by anti-Tim-4 5G3 or 3A1 staining (data not shown), and detected by goat anti-rat IgG1-FITC. Tim-4 expression on CD11c+ cells is shown in B and on CD11b+ cells in C.
The restriction of Tim-4 expression to mature APCs suggested that Tim-4 could play an important role in regulating Ag presentation and T cell activation. Previous data showed that a soluble Tim-4.Ig fusion protein could enhance or inhibit T cell proliferation depending on the dose of anti-CD3/anti-CD28 used in in vitro stimulation assays (15). Nonetheless, when given in vivo, Tim-4.Ig resulted in hyperproliferation (15). These data could not clearly demonstrate whether Tim-4 expressed on APCs enhances T cell activation and expansion or blocked an inhibitory signal. To begin to elucidate how Tim-4 could mediate its function, we analyzed the effects of Tim-4 expression on Ag presentation in vitro. It has been demonstrated that CHO cells can act as artificial APCs (18) that may induce T cell activation by presenting anti-CD3 and anti-CD28 to T cells via Fc receptors together with coreceptors expressed on the CHO cell surface. We therefore analyzed the ability of CHO-Tim-4 transfectants to stimulate T cells in vitro. Whereas the presence of anti-CD3 and anti-CD28 could induce proliferation of T cells when presented by control CHO cells, CHO-Tim-4 cells induced dramatically higher T cell proliferation than did the control transfectants (mock-transfected CHO cells or CHO-Tim-3 transfectants) (Fig. 4⇓A and data not shown). 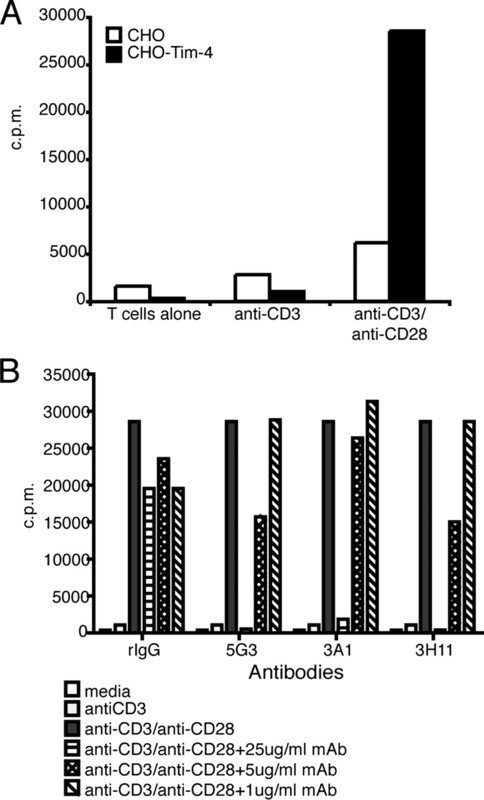 This proliferation was dependent, however, on CD28 costimulation, as CHO-Tim-4 transfectants could not induce proliferation of naive T cells in the absence of anti-CD28. These data suggest that Tim-4 expression may augment the stimulatory capacity of APCs. Tim-4 expression enhances CHO cells to induce T cell activation. A, CD3+ T cells purified from SJL/J lymph nodes were incubated with mitomycin C-treated CHO or CHO-Tim-4 cells, along with soluble anti-CD3 and anti-CD28. T cell proliferation was measured after 48 h by [3H]-thymidine incorporation in triplicate wells. B, Anti-Tim-4 mAbs can partially block CHO-Tim-4-induced T cell proliferation. T cells were incubated with CHO-Tim-4 as above, along with anti-Tim-4 mAbs at the concentrations indicated. Proliferation was measured after 48 h by [3H]thymidine incorporation in triplicate wells. To confirm that this difference in Ag-presenting capability was truly a specific effect of Tim-4 expression, anti-Tim-4 Abs were added to the cultures to block Tim-4 activity. Fig. 4⇑B demonstrates that the three anti-Tim-4 mAbs displayed varying abilities to block CHO-Tim-4-mediated T cell stimulation. Because CHO cells endogenously express costimulatory molecules (18), and these molecules could thus cooperate with Tim-4 to mediate the observed stimulatory effects, we developed a Tim-4.Ig-coated bead assay to more clearly elucidate the mechanism and effects mediated by Tim-4. We coated magnetic beads with anti-CD3, anti-CD28, and Tim-4.Ig fusion protein or isotype control (HuIgG1) and used these beads to stimulate T cells in vitro. Compared with HuIgG1-coated beads, Tim-4.Ig-coated beads could strongly augment T cell expansion, similar to the results seen with CHO-Tim-4 cells (Fig. 5⇓A). Cytokine analysis of these cultures showed a corresponding induction of IFN-γ and TNF-α production by Tim-4.Ig/antiCD3/antiCD28 stimulation (Fig. 5⇓B). 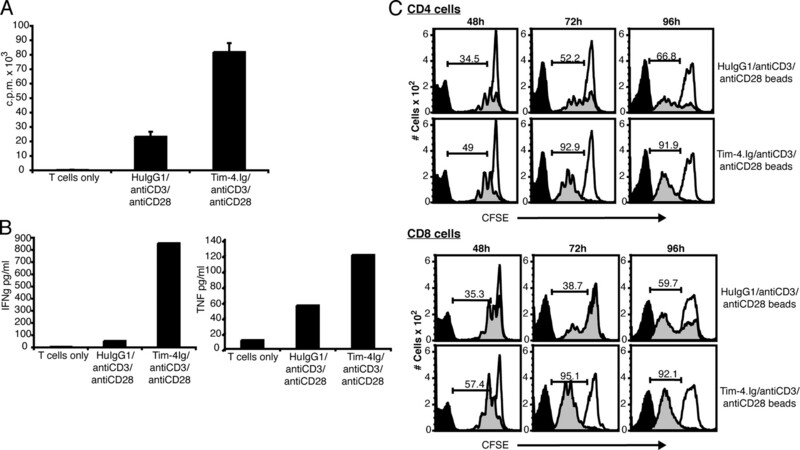 These data clearly showed that Tim-4.Ig cooperated with TCR and CD28 signals to enhance T cell expansion. To measure whether increased expansion induced by Tim-4.Ig is due to increased cell division or increased cell survival, we used these Tim-4.Ig-conjugated beads to stimulate CFSE-labeled C57BL/6 CD3+ T cells, and analyzed cell division by dye dilution after 48, 72, and 96 h. Tim-4.Ig/antiCD3/antiCD28 beads increased cell division of both CD4+ and CD8+ T cells, as observed by increased dye dilution in the responding T cells (Fig. 5⇓C). Tim-4.Ig-coated beads stimulate T cell proliferation and cytokine production. CD3+ T cells were purified and cultured with Tim-4.Ig/antiCD3/antiCD28-coated or HuIgG1/antiCD3/antiCD28-coated beads. A, At 48 h, proliferation was measured by [3H]thymidine incorporation in triplicate wells and B, cytokine production was analyzed by cytometric bead array. C, CFSE-labeled CD3+ T cells were cultured as in A for 48, 72, and 96 h. T cells were stained with CD4-allophycocyanin or CD8-allophycocyanin and analyzed by flow cytometry. Black histograms correspond to unlabeled cells; open histograms correspond to CFSE-labeled cells; shaded histograms correspond to CFSE-labeled, stimulated cells. The percentage of cells that have undergone cellular division is indicated in each histogram. It was clear that Tim-4.Ig/antiCD3/antiCD28 beads could enhance T cell expansion by inducing cell division. We next sought to determine the biochemical mechanisms responsible for Tim-4.Ig-mediated increases in T cell expansion and cytokine production. Tim-4.Ig/antiCD3/antiCD28-coated beads or HuIgG1/antiCD3/antiCD28-coated beads were used to stimulate purified CD3+ T cells for different amounts of time. First, we wanted to determine whether Tim-4.Ig could enhance tyrosine phosphorylation of various proteins beyond what is observed with control Ig/antiCD3/antiCD28 stimulation alone. Immunoblot analysis showed that Tim-4.Ig/antiCD3/antiCD28-coated beads induced more total tyrosine phosphorylation in the responding T cells compared with HuIgG1/antiCD3/antiCD28 (Fig. 6⇓A). Because the phosphorylation of Tim-1 has been observed upon cross-linking this receptor with anti-Tim-1 mAb (19), we tested whether Tim-4, an endogenous Tim-1 ligand, could also induce Tim-1 phosphorylation. 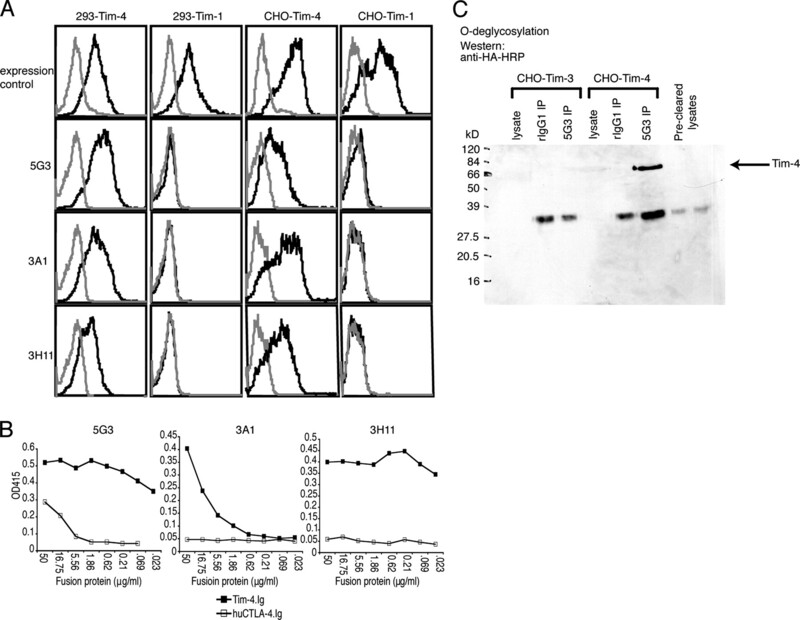 Tim-4.Ig/antiCD3/antiCD28 beads induced the phosphorylation of Tim-1, whereas no phosphorylation of Tim-1 was detected with HuIgG1/antiCD3/antiCD28 (Fig. 6⇓B). Upon further analysis, we found that Tim-4.Ig could rapidly enhance phosphorylation of the adaptor protein linker for T cell activation. We also examined CD3-ζ-phosphorylation and saw occasional increases after Tim-4.Ig stimulation although this effect was not consistently observed (Fig. 6⇓C). Because linker for T cell activation phosphorylation has been implicated in the induction of the ERK MAPK pathway (20), levels of p-ERK1/2 were analyzed following T cell activation with Tim-4.Ig beads. Tim-4.Ig/antiCD3/antiCD28-coated beads induced higher levels of ERK phosphorylation compared with HuIgG1/antiCD3/antiCD28 (Fig. 6⇓D). In addition, Tim-4.Ig enhanced phosphorylation of Akt, compared with levels detected when HuIgG/antiCD3/antiCD28-coated beads were used to stimulate the responding T cells (Fig. 6⇓D). Tim-4.Ig-coated beads induce tyrosine phosphorylation in responding T cells. CD3+ T cells were stimulated for the times indicated with Tim-4.Ig/antiCD3/ antiCD28 beads or HuIgG1/antiCD3/antiCD28 beads. Lysates were probed for protein phosphorylation by Western blot using anti-p-Tyr, anti-β-actin (A), anti-p-Akt, anti-p-ERK1/2, and-ERK1/2 Abs (D). CD3+ T cells were stimulated as in A and D for the indicated times and then lysates were immunoprecipitated with anti-p-Tyr agarose beads. Immunoprecipitates were then probed by Western blot using anti-Tim-1-biotin (B), anti-p-LAT, or anti-CD3ζ Abs (C). Because Akt has been implicated in mediating protection from apoptotic cell death (21, 22), we next sought to determine whether Tim-4.Ig could also promote cell survival and inhibit apoptotic cell death. To determine the ability of Tim-4.Ig to mediate cell survival signals, purified T cells were cultured with Tim-4.Ig/antiCD3/antiCD28 or HuIgG1/antiCD3/antiCD28 beads, and after 24 or 48 h, cells were lysed to analyze the induction of survival factors. Cell lysates were run on a 4–20% gradient SDS-PAGE and blotted with anti-Bcl-2 Ab and anti-β-tubulin. The blots were then stripped and re-probed with anti-Bcl-xL/S Ab. Tim-4.Ig/ antiCD3/antiCD28 beads specifically induced higher levels of Bcl-2 protein than did HuIgG1/antiCD3/antiCD28 beads after 48 h. However, Tim-4.Ig did not induce any further increase in the expression of Bcl-xL above what was observed with the HuIgG1/antiCD3/antiCD28 beads (Fig. 7⇓A). To further analyze whether Tim-4.Ig stimulation resulted in increased cell survival, purified T cells were cultured with Tim-4.Ig/antiCD3/antiCD28 beads or HuIgG1/antiCD3/antiCD28 beads and the proportion of T cells undergoing cell death was analyzed. At 24, 48, and 72 h, T cells were separated from the coated magnetic beads and stained with Annexin V and propidium iodide to determine the frequency of apoptotic cell death. At each time point, the frequency of live cells (Annexin V−, PI−) was greater in the cultures stimulated with Tim-4.Ig/antiCD3/antiCD28 beads than in the cultures stimulated with HuIgG1/antiCD3/antiCD28 beads (Fig. 7⇓B). Tim-4 signaling thus appears to stimulate T cell expansion by inducing both cell division and anti-apoptotic signals. Tim-4.Ig-coated beads induce signals that rescue T cells from apoptosis and induce Bcl-2. A, Tim-4 induced the up-regulation of Bcl-2. CD3+ T cells were stimulated for 24 and 48 h with Tim-4.Ig/antiCD3/antiCD28, HuIgG1/antiCD3/antiCD28, or no stimulus. Cell lysates were immunoblotted with anti-Bcl-2 and anti-β-tubulin. Films were stripped and reblotted with anti-Bcl-xL/S. Gels were analyzed by using National Institutes of Health ImageJ software and shown is the expression relative to the untreated samples. B, CD3+ T cells were cultured as in A for 24, 48, and 72 h. T cells were then separated from the magnetic beads, stained with CD4-allophycocyanin or CD8-allophycocyanin, Annexin V-FITC, and propidium iodide. Samples were analyzed by flow cytometry. In this article, we investigated the expression and function of the Tim family member Tim-4. Whereas Tim-1, Tim-2, and Tim-3 have been described as proteins expressed on T cells (5, 8, 10), we show in this study that Tim-4 is expressed solely on non-T cells. Tim-4 protein is expressed on the surface of activated DCs and macrophages, and overexpression of Tim-4 makes CHO cells remarkably competent APCs that can induce massive proliferation of CD3+ T cells. Using bead-bound Tim-4.Ig fusion protein in the context of anti-CD3 and anti-CD28, we show that Tim-4, interacting with its receptor(s) on T cells, induces signals leading to both cell division and cell survival by up-regulation of the anti-apoptotic molecule Bcl-2. We thus conclude that Tim-4 expressed on the surface of professional APCs promotes their ability to stimulate, expand, and enhance the survival of T cells. We previously showed that administration of Tim-4.Ig in vivo induces T cell hyperproliferation and enhances cytokine production. However, the paradoxical effect of low vs high concentrations of plate-bound anti-CD3 and anti-CD28 mAbs in the presence of Tim-4.Ig on T cell expansion (15) suggested a more complex role of Tim-4 in T cell activation. We addressed the role of Tim-4 in T cell responses by using two different in vitro assay systems and show that Tim-4 synergizes with CD28 to induce costimulation and massive expansion of T cells. Tim-4 may thus be considered a new mediator of a group of signals, collectively termed signal 3, which synergize with signal 2 to mediate T cell expansion. In the presence of anti-CD3 plus anti-CD28, CHO cells transfected with Tim-4 were able to stimulate T cells to proliferate 50–100-fold more than could T cells incubated with untransfected CHO cells. Upon transfection with Tim-4, CHO and 293T cells both become remarkably adhesive compared with untransfected cells (data not shown). This observation, together with the presence of an RGD motif in the IgV domain of Tim-4, could indicate that Tim-4 strengthens adhesiveness between an APC and T cell resulting in stronger interactions between key activating receptors of T cells and APCs, and thereby promotes the formation of stronger APC:T cell conjugates. In addition to stronger adhesion, the interaction between Tim-4 and its receptor(s), including Tim-1, could induce signals into T cells leading to this potent stimulation. Therefore, in addition to prolonged adhesion between APC and T cells leading to the enhancement of signal 2, Tim-4 could induce its own specific signals, via Tim-1 or another receptor, that synergize with signal 2 and thereby enhance T cell responses. The signaling pathways triggered downstream of Tim-1 are just beginning to be elucidated. Overexpression of Tim-1 costimulates NFAT/AP-1 transcription in a manner that is dependent on Tim-1 tyrosine-phosphorylation (16). Also, cross-linking of Tim-1 with anti-Tim-1 mAb induces an increase in phospho-Tim-1 and triggers downstream signaling events including an increase of phospho-Zap70 and formation of novel complexes between PI3K and ITK by recruitment of Tim-1 to the TCR-signaling complex (19). However, the effect of Tim-4 on Tim-1 and the induction of T cell signaling pathways has not been studied. In this study, we show that along with TCR stimulation, Tim-4 is sufficient to induce Tim-1 tyrosine-phosphorylation. This clearly shows that Tim-4 can functionally engage Tim-1 on the surface of T cells and induce its phosphorylation. In addition, our data shows that Akt, a mediator of PI3K activity, is phosphorylated upon cross-linking with Tim-4.Ig. This finding is in agreement with previous data linking PI3K activity to Tim-1 expression (19) and further implicates the Tim-4-Tim-1 interaction in regulating T cell expansion. Our data do not exclude the possibility, however, that Tim-4 may be the ligand for an additional receptor on the surface of T cells, and that Tim-4, interacting with this putative receptor, could also impact T cell responsiveness. Recent data support a bimodal function for Tim-4 in T cell regulation that is dependent on the activation profile of the responding T cells (Hitoshi Kikutani, personal communication). Tim-1 expression is up-regulated upon T cell activation. However, naive T cells can still bind Tim-4.Ig (data not shown) confirming the expression of an additional Tim-4 receptor that remains unidentified at this time. Therefore, Tim-4 could mediate an inhibitory signal different from the signal induced through Tim-1. In addition, recent data suggest that Tim-1 can either enhance or inhibit T cell expansion and effector function depending on the affinity/avidity with which Tim-1 is engaged (23). Two anti-Tim-1 mAbs were shown to differentially engage Tim-1, with one anti-Tim-1 clone increasing the frequency of Ag-specific T cells, the production of proinflammatory cytokines, and the severity of autoimmune disease, and another Tim-1 clone inhibiting this response (23). Therefore, it is possible that Tim-4 engages Tim-1 differentially depending on the strengths of signals 1 and 2, thereby providing either a costimulatory signal or an inhibitory signal as was seen in previous in vitro assays (15). The dominant mechanism initiated by Tim-4 through Tim-1 is being investigated presently in vivo by using Tim-1- or Tim-4-deficient mice. Our findings suggest that Tim-4 signals both stimulate T cell division and promote T cell survival. Whereas CD28 has been shown to preferentially induce the up-regulation of the anti-apoptotic protein Bcl-xL (24), we found that Tim-4 signaling selectively increased expression of the survival factor Bcl-2 protein. 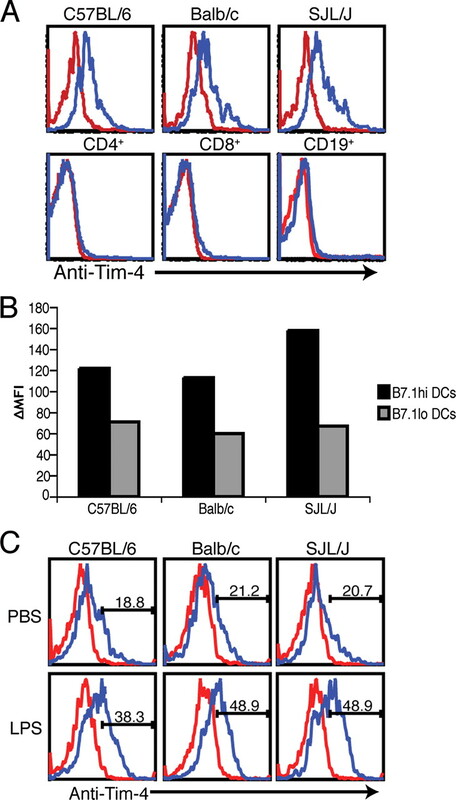 This observation suggests that Tim-4 does not simply enhance CD28 costimulatory signals, but can also mediate unique signals into T cells, including selectively inducing Bcl-2. The idea that signaling through the Tim-4 receptor costimulates T cells is consistent with the finding that ligation of Tim-1 by an agonistic anti-Tim-1 Ab costimulates T cell proliferation and cytokine production (10). Under our assay system, it is clear that Tim-4 is engaging Tim-1 and inducing phosphorylation of Tim-1 concurrent with the induction of T cell expansion. The absence of any recognizable signaling motifs in the intracellular tail of Tim-4 suggests that Tim-4 may act primarily by signaling into cells that express its receptor(s), rather than into the APC on which it is expressed. It is possible, however, that Tim-4 may also transduce a signal into APCs, perhaps through an associated signaling molecule. The recent evidence that Tim-4 is also the receptor for phosphatidylserine and is involved in the clearance of apoptotic bodies (25, 26) suggests that Tim-4 expressed on APCs must not only bind apoptotic cells, but also activate APCs to engulf the dying cells by interacting with other receptors on the cell surface. Tim-4 was previously described as a molecule expressed on splenic stroma (27). The higher frequency of Tim-4-expressing cells in the spleen but low frequency in other tissues (15) suggested that Tim-4 could have an important function in lymphoid organs. Our immunohistochemical (data not shown) and functional data specifically implicate Tim-4 in DC and macrophage APC functions in lymphoid tissues. Expression of Tim-4 protein on peripheral APCs correlated with the severity of autoimmune disease (data not shown), however, further investigation is needed to determine whether this expression is directly linked to the induction and expansion of T cell responses in vivo. In summary, we have begun to unravel the function of Tim-4 and propose that Tim-4-mediated signals, via Tim-1, induce T cell expansion by both inducing cell division and signals that concurrently rescue cells from apoptotic death. Therefore, our studies suggest that Tim-4 belongs to a group of signals collectively termed signal 3, which could synergize or antagonize CD28 costimulatory signals to expand or inhibit T cell activation and expansion depending on the receptor it engages on T cells. We thank R. Chandwaskar and D. Lee for assistance with cytometric bead array analysis, C. Baecher-Allan and D. Anderson for assistance with Dynal bead technology, and all laboratory members for discussions pertaining to the manuscript. ↵1 This work was supported by research grants from the National Multiple Sclerosis Society (RG3666 and RG2571D9) and the National Institutes of Health (NS045973, NS046414, NS35685, NS30843, AI44880, AI058680, P01AI139671, P01AI41521, and P01NS38037). R. Rodriguez-Manzanet is supported by Grant F31NS056503 from the NINDS. V. K. Kuchroo is a recipient of the Javits Neuroscience Investigator Award from the National Institutes of Health. ↵2 R.R.-M. and J.H.M. contributed equally to the work. ↵3 Current address: American Association of Immunologists, Bethesda, MD 20814. ↵5 Abbreviations used in this paper: TIM, T cell, Ig, mucin. Kuchroo, V. K., D. T. Umetsu, R. H. DeKruyff, G. J. Freeman. 2003. The TIM gene family: emerging roles in immunity and disease. Nat. Rev. Immunol. 3: 454-462. McIntire, J., D. Umetsu, R. DeKruyff. 2004. TIM-1, a novel allergy and asthma susceptibility gene. Springer Semin. Immunopathol. 25: 335-348. Kuchroo, V. K., J. H. Meyers, D. T. Umetsu, R. H. DeKruyff. 2006. TIM family of genes in immunity and tolerance. Adv. Immunol. 91: 227-249. Zhu, C., A. C. Anderson, A. Schubart, H. Xiong, J. Imitola, S. J. Khoury, X. X. Zheng, T. B. Strom, V. K. Kuchroo. 2005. The Tim-3 ligand galectin-9 negatively regulates T helper type 1 immunity. Nat. Immunol. 6: 1245-1252. Monney, L., C. A. Sabatos, J. L. Gaglia, A. Ryu, H. Waldner, T. Chernova, S. Manning, E. A. Greenfield, A. J. Coyle, R. A. Sobel, G. J. Freeman, V. K. Kuchroo. 2002. Th1-specific cell surface protein Tim-3 regulates macrophage activation and severity of an autoimmune disease. Nature 415: 536-541. Sanchez-Fueyo, A., J. Tian, D. Picarella, C. Domenig, X. X. Zheng, C. A. Sabatos, N. Manlongat, O. Bender, T. Kamradt, V. K. Kuchroo, et al 2003. Tim-3 inhibits T helper type 1-mediated auto- and alloimmune responses and promotes immunological tolerance. Nat. Immunol. 4: 1093-1101. Knickelbein, J. E., A. J. de Souza, R. Tosti, P. Narayan, L. P. Kane. 2006. Cutting edge: inhibition of T cell activation by TIM-2. J. Immunol. 177: 4966-4970. Chakravarti, S., C. A. Sabatos, S. Xiao, Z. Illes, E. K. Cha, R. A. Sobel, X. X. Zheng, T. B. Strom, V. K. Kuchroo. 2005. Tim-2 regulates T helper type 2 responses and autoimmunity. J. Exp. Med. 202: 437-444. Rennert, P. D., T. Ichimura, I. D. Sizing, V. Bailly, Z. Li, R. Rennard, P. McCoon, L. Pablo, S. Miklasz, L. Tarilonte, J. V. Bonventre. 2006. T cell, Ig domain, mucin domain-2 gene-deficient mice reveal a novel mechanism for the regulation of Th2 immune responses and airway inflammation. J. Immunol. 177: 4311-4321. Umetsu, S. E., W. L. Lee, J. J. McIntire, L. Downey, B. Sanjanwala, O. Akbari, G. J. Berry, H. Nagumo, G. J. Freeman, D. T. Umetsu, R. H. DeKruyff. 2005. TIM-1 induces T cell activation and inhibits the development of peripheral tolerance. Nat. Immunol. 6: 447-454. Khademi, M., Z. Illes, A. W. Gielen, M. Marta, N. Takazawa, C. Baecher-Allan, L. Brundin, J. Hannerz, C. Martin, R. A. Harris, et al 2004. T cell Ig- and mucin-domain-containing molecule-3 (TIM-3) and TIM-1 molecules are differentially expressed on human Th1 and Th2 cells and in cerebrospinal fluid-derived mononuclear cells in multiple sclerosis. J. Immunol. 172: 7169-7176. Koguchi, K., D. E. Anderson, L. Yang, K. C. O’Connor, V. K. Kuchroo, D. A. Hafler. 2006. Dysregulated T cell expression of TIM3 in multiple sclerosis. J. Exp. Med. 203: 1413-1418. McIntire, J. J., S. E. Umetsu, C. Macaubas, E. G. Hoyte, C. Cinnioglu, L. L. Cavalli-Sforza, G. S. Barsh, J. F. Hallmayer, P. A. Underhill, N. J. Risch, et al 2003. Hepatitis A virus link to atopic disease. Nature 425: 576-576. Mesri, M., G. Smithson, A. Ghatpande, A. Chapoval, S. Shenoy, F. Boldog, C. Hackett, C. E. Pena, C. Burgess, A. Bendele, R. A. Shimkets, G. C. Starling. 2006. Inhibition of in vitro and in vivo T cell responses by recombinant human Tim-1 extracellular domain proteins. Int. Immunol. 18: 473-484. Meyers, J. H., S. Chakravarti, D. Schlesinger, Z. Illes, H. Waldner, S. E. Umetsu, J. Kenny, X. X. Zheng, D. T. Umetsu, R. H. DeKruyff, et al 2005. TIM-4 is the ligand for TIM-1, and the TIM-1-TIM-4 interaction regulates T cell proliferation. Nat. Immunol. 6: 455-464.
de Souza, A. J., T. B. Oriss, K. J. O’Malley, A. Ray, L. P. Kane. 2005. T cell Ig and mucin 1 (TIM-1) is expressed on in vivo-activated T cells and provides a costimulatory signal for T cell activation. Proc. Natl. Acad. Sci. USA 102: 17113-17118. Kohler, G., C. Milstein. 1975. Continuous cultures of fused cells secreting antibody of predefined specificity. Nature 256: 495-497. Gaglia, J. L., A. Mattoo, E. A. Greenfield, G. J. Freeman, V. K. Kuchroo. 2001. Characterization of endogenous Chinese hamster ovary cell surface molecules that mediate T cell costimulation. Cell. Immunol. 213: 83-93. Binne, L. L., M. L. Scott, P. D. Rennert. 2007. Human TIM-1 associates with the TCR complex and up-regulates T cell activation signals. J. Immunol. 178: 4342-4350. Martelli, M. P., H. Lin, W. Zhang, L. E. Samelson, B. E. Bierer. 2000. Signaling via LAT (linker for T-cell activation) and Syk/ZAP70 is required for ERK activation and NFAT transcriptional activation following CD2 stimulation. Blood 96: 2181-2190. Bommhardt, U., K. C. Chang, P. E. Swanson, T. H. Wagner, K. W. Tinsley, I. E. Karl, R. S. Hotchkiss. 2004. Akt decreases lymphocyte apoptosis and improves survival in sepsis. J. Immunol. 172: 7583-7591. Jones, R. G., M. Parsons, M. Bonnard, V. S. Chan, W. C. Yeh, J. R. Woodgett, P. S. Ohashi. 2000. Protein kinase B regulates T lymphocyte survival, nuclear factor κB activation, and Bcl-X(L) levels in vivo. J. Exp. Med. 191: 1721-1734. Xiao, S., N. Najafian, J. Reddy, M. Albin, C. Zhu, E. Jensen, J. Imitola, T. Korn, A. C. Anderson, Z. Zhang, et al 2007. Differential engagement of Tim-1 during activation can positively or negatively costimulate T cell expansion and effector function. J. Exp. Med. 204: 1691-1702. Boise, L. H., A. J. Minn, P. J. Noel, C. H. June, M. A. Accavitti, T. Lindsten, C. B. Thompson. 1995. CD28 costimulation can promote T cell survival by enhancing the expression of Bcl-xL. Immunity 3: 87-98. Kobayashi, N., P. Karisola, V. Pena-Cruz, D. M. Dorfman, M. Jinushi, S. E. Umetsu, M. J. Butte, H. Nagumo, I. Chernova, B. Zhu, et al 2007. TIM-1 and TIM-4 glycoproteins bind phosphatidylserine and mediate uptake of apoptotic cells. Immunity 27: 927-940. Miyanishi, M., K. Tada, M. Koike, Y. Uchiyama, T. Kitamura, S. Nagata. 2007. Identification of Tim4 as a phosphatidylserine receptor. Nature 450: 435-439. Shakhov, A. N., S. Rybtsov, A. V. Tumanov, S. Shulenin, M. Dean, D. V. Kuprash, S. A. Nedospasov. 2004. SMUCKLER/TIM4 is a distinct member of TIM family expressed by stromal cells of secondary lymphoid tissues and associated with lymphotoxin signaling. Eur. J. Immunol. 34: 494-503.